Home Politics Judge Kavanaugh or Justice Kavanaugh? Judge Kavanaugh or Justice Kavanaugh? President Trump nominated Brett Kavanaugh, an American attorney and United States Circuit Judge of the United States Court of Appeals for the District of Columbia Circuit, to the United States Supreme Court. Judge Kavanaugh is a highly educated man who went to very academically intensive schools. He went to Georgetown Preparatory School for high school, where he was a man of superior intellect amongst his peers. Brett Kavanaugh received his undergraduate and his law degree from Yale, was a legal clerk for Supreme Court Justice Anthony M. Kennedy, and spent a great deal of his professional career working for the government. Kavanaugh also served for four years as an assistant to independent counsel Kenneth W. Starr in the investigations of the Clinton administration and the suicide of Clinton aide Vince Foster. Kavanaugh also served five years in the administration of President George W. Bush, first as an associate counsel and then as staff secretary. Bush nominated Kavanaugh to the U.S. Court of Appeals for the D.C. Circuit, which he served on for many years. He has more than 300 opinions on that D.C. Circuit court, thus maintaining a consistently conservative legal ruling record. A Supreme Court nominee is subject to many conversations across the country due to the weight they carry in the court. The Supreme Court rules on woman’s rights, drugs, abortion and many other issues of great importance. The nomination by the president is the first step. The second is background checks and investigations, which are thoroughly conducted to ensure that one of nine judges sitting on the most powerful bench is a legitimate candidate. Next, the Senate Judiciary Committee convenes for a week to hold daily hearings to inquire and learn about the nominee’s history and precedent on current and past legal issues. Then, if confirmed by the committee with a majority vote, the vote on the nominee moves on to the full Senate, where a majority vote is required to confirm him or her to the Supreme Court. This is a perfect example of checks and balances in our country. One branch nominates the other votes and confirms, elevating someone to the third and final branch, the judicial branch. 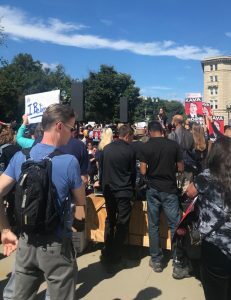 During Kavanaugh’s confirmation hearing, over two hundred protesters were arrested. Some protesters were screaming and chanting in the back of the room while others wore the handmaid tale outfit and convened in a silent protest. The protesters were protesting conservatism and the potential removal of women’s rights. The proceedings went as could be expected. They went through Kavanaugh’s knowledge of the Constitution, the Federalist Papers, and of course his legal background. Following the confirmation hearings, the prospective Supreme Court Justice was viewed favorably by many until the allegations of sexual assault came to light. To quote the article describing the event from the Washington Post, who the alleged victim spoke to directly, “Christine Blasey Ford alleges that sometime in 1982, at a friend’s house, Kavanaugh pinned her on a bed, drunkenly groped her, tried to take off her clothes and put his hand over her mouth when she tried to scream.” Christine Blasey Ford came forward to speak before the Senate Judiciary Committee and gave her testimony. She was heartfelt and full of emotion. Many Democratic senators jumped to her defense and support, despite the numerous flaws and gaps in her story. Ford has named numerous alleged witnesses, who were questioned and all denied claims of being there or that the alleged event occurred. Additionally, some specific details regarding the location, time, and date are unclear. The use of alcohol, an intoxicating substance, and the fact that this happened over 30 years ago may account for the gaps in the story. The Republican senators submitted their questions to an outside counsel to ask and inquire about, while the Democratic senators asked questions directly. Following Ford’s testimony, Judge Kavanaugh testified and was under the intense pressure of Democratic senators. A heated exchange full of emotions brought both sides to elevated levels. Ford elaborated on how the trauma that occurred in high school affected her in the long term, in regards to relationships, planes, and in an educational sense. Kavanaugh was outraged over the damage that has been done to his reputation and how this allegation can affect his future. Damage has been done to both sides, and the whole ordeal is very sad, which was the consensus according to many political commentators and senators. Following the testimony, which brought both Kavanaugh and Ford to tears, the Committee was given a lot of time to consider what they had heard during the hearings and eventually went to a vote. The vote went to a majority swing in favor of confirming Judge Kavanaugh. The Senate also asked for another FBI investigation into the allegations to help determine the validity. 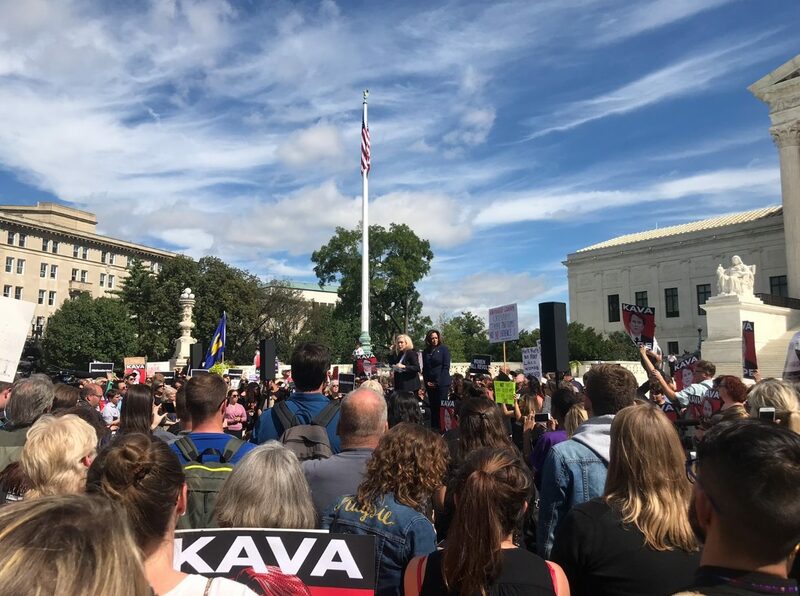 Outside the Supreme Court, protests occurred for hours, before and during the vote. Pizza was delivered and therapy dogs were provided. Pro-women’s rights groups, as well as planned parenthood and survivor advocates, were all in attendance. 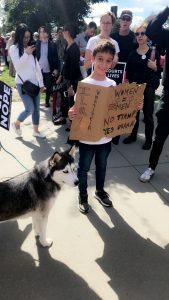 Senators from Hawaii, Minnesota, New York, Connecticut, and California gave speeches and led the protests. All these senators voted against the confirmation of Judge Kavanaugh. Following the protests in front of the Supreme Court, the protesters traveled in groups to the offices of Republican senators demanding to not confirm him as well. Other protests in the Senate building led to arrests and numerous cases of harassment against Republicans senators and office staff. The current status on the confirmation of Judge Kavanaugh is that the FBI will investigate the allegations in about a week’s time frame and then the vote will follow with the FBI’s report.